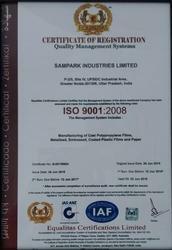 Sampark Industries Limited, established in the year 2001, is counted amongst the leading manufacturers, suppliers, exporters and traders of a diverse range of Cast Polypropylene Films, Metalized Plastic, Lacquered Plastic Films, Holographic Film and Paper Films. Our impeccable array of products consists of Cast Polypropylene Films, Metallized Papers and Metallized Plastic Films. The offered products are manufactured using the best quality raw materials available in the market. We have a highly developed state-of-the-art-infrastructure, equipped with modern machinery and equipment, which spreads over a huge area. In order to achieve hassle free operations, we have divided our infrastructure into a number of units. Further, we hire trained and skilled professionals, who efficiently handle the high-tech machinery. These divided units work in complete coordination to achieve the common goals of the organization. We export our products all over the world. Our mission is to offer superior quality product at very affordable prices to ensure best return of customers' money. Moreover, we aim to conduct all our business dealings with ethical and fair business practices to develop trust in the minds of our stakeholders. 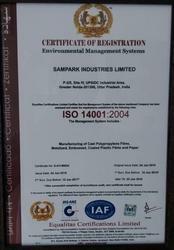 At Sampark Industries Limited, our success is owed to a team of highly qualified and experienced employees. These employees work in unity for the purpose of achieving several organizational goals and objectives. In order to attain smooth and hassle free operations, we have parted our teams into a number of units. Further, these units work in complete coordination to formulate new and better techniques to reduce cost and increase production. We, at Sampark Industries Limited, have a modernized state-of-the-art infrastructure, which consists of various advanced machinery and sophisticated equipment to facilitate smooth functioning. Our infrastructure is regularly upgraded in order to achieve the status of being the leading manufacturer in the market. Our infrastructure facilitates productivity, improves quality and promotes R&D as well. Efficient stock handling, ready availability of packaging materials and good resources are some of the attributes that have been supporting our efforts to deliver products on time and as per clients requirement. We meet urgent & contingency orders with high level of efficiency and never compromise on delivering committed quality. Our organized stock management and adherence to 99% on-time delivery ensures that process at client's end is not hampered. Prompt logistics and capacious warehousing facilities help us in meeting the delivery deadlines. Our consistency in delivering qualitative range of Cast Polypropylene Films, Metallized Paper, Metallized Plastic Films, Window Metallized, Holographic Films, Lacquered Plastic Film in variety of printing, coatings and finishing has helped us to add many national & international clients to our list. Our keen approach to meet market needs with innovative flexible packaging material and holograms has also helped us to maintain a competitive edge in the market and cater to clients from diverse industries such as pharmaceuticals, food & beverages, oil & lubricants, textile & apparel, cosmetics & personal care products, automobiles components etc. The cosmetic & personal care market makes use of amazing and innovative marketing methods and the packaging material is instrumental in these endeavours. Hence, we make every effort to continually offer different types of flexible & holographic packaging materials that are functional and attractive. We are committed to assist our customers promote their brand identities with customized packaging materials. We, being one of the leading manufacturers and exporters of a diverse range of metalized plastic and paper films, consider quality to be of utmost importance to us. Thus, we never sacrifice the quality we are providing. We indulge in the using of high grade raw materials that are available in the market. Post the production process, we send all our products to our team of highly trained quality analysts, who, with high efficiency eliminates manufacturing defects. We take pride in being a client centric firm. For the purpose of maintaining this reputation, we engage in the use of raw materials of the highest grade procured from reliable vendors. In addition, we send these products for several quality examinations for the purpose of making sure of the standard of products we offer. Further, we manufacture all our products strictly as per the industrial standards, and provide them to the clients at a market leading price.